Every mower operator develops their own techniques for mowing a lawn, but a few general lawn mowing tips are worthy of consideration for a good trim. Give the grass a chance by not cutting it too short, especially in hot dry weather. One may have special reasons for wanting a close-cropped lawn, but if the grass is left approximately 1-1/2 inches long, it will provide some shade for the soil below giving the roots a better chance. Such a lawn also will withstand the wearing of many small feet better than a short-cut lawn. Lowering the roller on reel type and raising each wheel on rotary mowers increases the height at which the grass is cut. The lawn will look better if it is cut often. 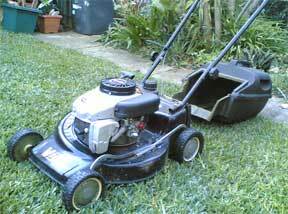 Moreover, when the pieces of cut grass are short, they fall down among the blades of grass adding a little protection and organic matter; those that remain on top are less conspicuous than longer pieces would be. While it may be easier to follow the same pattern when mowing the lawn — around the yard or back and forth – it is helpful to alternate the direction of travel, even going on the diagonal occasionally. If you want to do an especially high-class job, mow the lawn twice, the second time at right angles to the first. It may take some practice to become skilled with a mower. By all means, let the machine do the work and don’t fight it. Keep the handles up so the weight will be on the wheels for better traction. On turns, bear down on the handles, rotating the machine on the roller with a gliding motion and letting the wheels down gradually at the same time with a little forward push. This should prevent any digging or marking of the lawn even if young and tender. Take care in setting the throttle so as not to go too fast, and don’t try to take an overly wide cut.